Once again, Lenovo came really close to making a great tablet, but one major flaw keeps the IdeaPad A2109 from a wholehearted recommendation. Android tablets in the 9-inch range aren’t as plentiful as 7 and 10-inch models, and that’s a shame. This in-between category offers a nice balance, with a screen big enough to comfortably read a full-layout magazine or watch a video and an overall size small enough that most can use it one-handed. The Lenovo IdeaTab A2109 is a good example of why tablets at this size are desirable and comes in at the budget-friendly price of $300 (often $260 at retail). With that relatively low price comes some trade-offs, most notably in the display quality. At just $60 – $100 more than the Nexus 7, is the IdeaTab a Goldilocks device? Read on to find out. 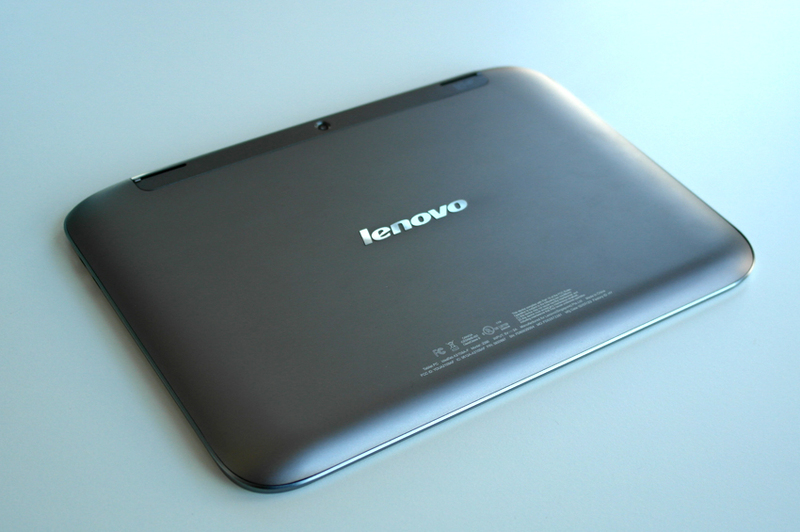 The IdeaTab A2109 shares the same design language of many Lenovo tablets of the past, including the IdeaPad K1 and the IdeaTab S2109. This isn’t a bad thing since there are aspects of those designs that work well and we liked. Particularly the rounded corners and solid feel. As with its predecessors, this IdeaTab feels a little chunky in a world where it seems every Android tablet is aiming for wafer-thinness. However, we’ve seen how that can be taken too far. And the thickness here — just 0.46 inches — isn’t egregious and actually gives the A2109 some substance in the hand. The overall footprint still feels big for its size. Coming in at 9.3 inches wide and 6.5 inches tall, the IdeaTab could stand to be a bit more compact like the Galaxy Tab 8.9, which had a footprint of 9.1 x 6.2 inches. Unlike the IdeaTab S2110 we recently reviewed, the aluminum A2109 doesn’t have the same poor build quality issues. It’s solid and doesn’t give when squeezed or pressed. Trading plastic for metal does mean more weight, thus the tablet clocks in at 1.3 pounds. That’s less than the iPad’s 1.44 pounds; the same as the Galaxy Tab 2 10.1 (which is plastic), and heavier than the 1.14 pound Nook HD+ (also plastic). Thanks to the size, the IdeaTab is fine to hold in one hand and thus easier to extract and use when standing on in crowded situations. The edges are flat, which make accessing the buttons easier by feel alone (in the dark, for example) and give ample space for the micro HDMI and Micro USB ports on the right side. On the opposite edge of the spectrum sits the headphone jack, volume rocker, and orientation lock. The power button is on the top in landscape mode, but positioned near the left edge so it’s well away from your hands when held in portrait (vertical) orientation. The flat edges don’t make holding the IdeaTab uncomfortable, and overall the experience is pleasant in both orientations. In front, the 9-inch display is glossy and kicks back reflections in well-lit rooms. There’s no Gorilla Glass and the anti-fingerprint coating is not as effective as we’d like. 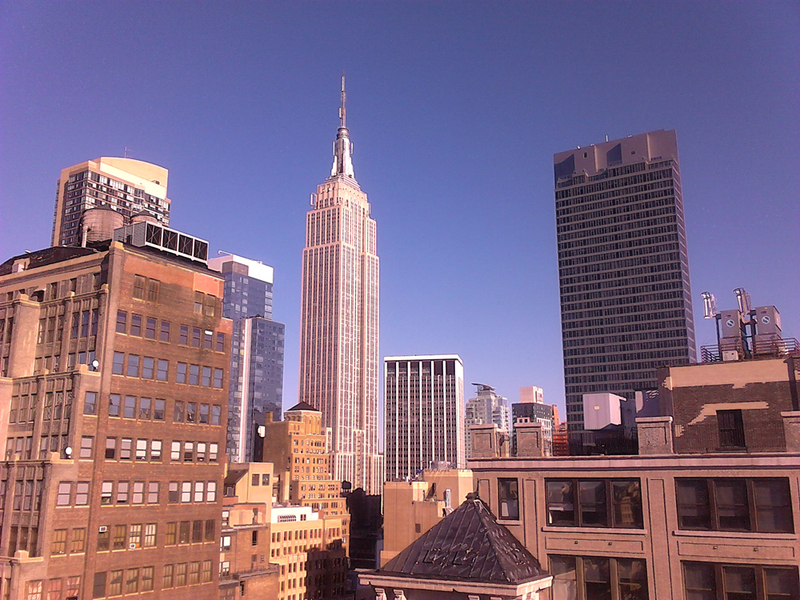 Above it, centered in the landscape orientation, is a 1.3MP camera. On the back, you’ll find two speakers and a 3MP rear-facing camera. The bit on back where these sit is removable, revealing a microSD card slot that takes cards up to 32GB. This is somewhat difficult to remove, indicating that Lenovo expects owners to insert a card once and mostly leave it alone. If you’re a frequent card swapper, this could pose a problem. 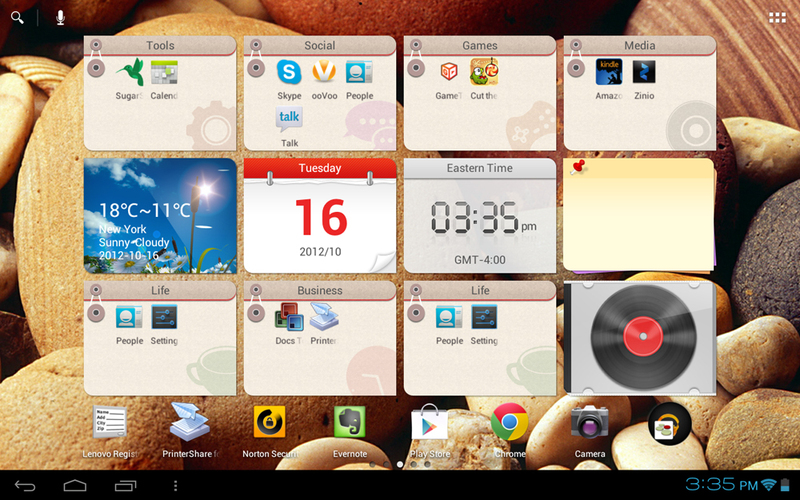 Just as with the S2110, this IdeaTab runs Android 4.0 (Ice Cream Sandwich) with some attractive and useful UI tweaks. The skin here isn’t as extensive as TouchWiz from Samsung or Sense from HTC, but those of you who prefer stock Android will probably turn up your noses nonetheless. Lenovo hasn’t said whether the A2109 is getting an upgrade to 4.1 (Jelly Bean). But if you’re less interested in the version number and more concerned about the experience, the A2109 delivers. 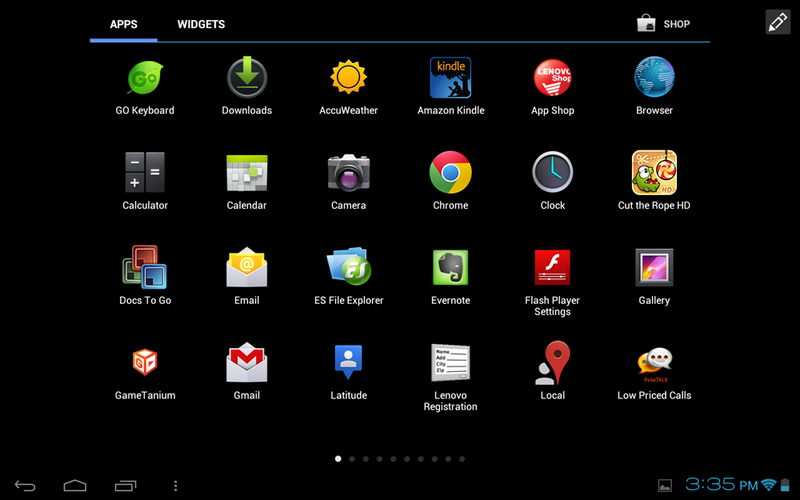 At launch, the Home screen presents users with several widgets and pre-populated smart folders. For people new to the OS, this can be useful. The widgets are well designed and match the folders, so everything feels like it fits together. Tapping on the folders expands them and reveals apps that fit the theme (Social, Games, Media, etc). These are customizable, and under the Widgets menu you can find more themes. There are several more aesthetically pleasing widgets available here, too. The UI includes a bit of eye candy when swiping between Home screens and in the App Drawer. Thanks to the Tegra 3 chip inside, this doesn’t mean a sluggish system as it does on the S2110. The animations are smooth and fast, just as they should be. The speedy performance is also noticeable when playing games like Temple Run, Fruit Ninja, or Grand Theft Auto III or watching video on YouTube and Hulu Plus. However, when engaging in these activities we noticed issues with the display. Viewing angles aren’t very wide. If you hold the A2109 in landscape mode and tip the tablet backward or forward, you almost immediately encounter color distortion. Tilting left or right isn’t as bad. In portrait, when we tilted the tablet to collect coin in Temple Run the darkened screen obscured much of the edges. Yes, this is a budget tablet, and for some these problems are not complete deal-breakers. Still, given that the display is one of the most important components on a tablet, it’s frustrating that Lenovo decided this was a good place to cut a corner. One bright spot for multimedia is that the speakers in the back provide decent audio quality and good volume. As you get closer to 100 percent the quality degrades. But it’s not necessary to turn the tablet all the way up for decent boom. Lenovo includes around 30 pre-loaded apps with the A2109 that range from games to media to productivity. Some are useful and among the top apps we’d recommend for new Android tablet owners, but too many seem superfluous and feel like “crapware”. One of the pre-loaded apps is the Go Keyboard, which we’ve seen on other Lenovo tablets and wish they’d stop including. It’s not well designed and the customization options don’t make it any better or easier to use. Thankfully, you can fall back on the stock Android keyboard or download a better one (like SwiftKey X). The IdeaPad has great specs for a budget tablet. It runs on a 1.2GHz quad-core Nvidia Tegra 3 chip backed by 1GB of RAM, 16GB of internal flash storage (an 8GB version is also available at Lenovo’s website, but is more expensive), and a 9-inch 1280 x 800 pixel TFT LCD screen. Ports include a microSD slot, Micro USB, Micro HDMI, a combo headphone/mic jack, plus an internal microphone. There are two cameras: a 1.3-megapixel one on the front and a 3.0-megapixel one on the back. There is no flash. Wireless radios include Bluetooth 3.0, b/g/n Wi-Fi, and GPS. There are two speakers on the back, and an accelerometer. It does not have NFC compatibility. In our standard Quadrant benchmarking test, the IdeaTab S2109 scored 4,078. Oddly, this is not as high as the IdeaTab S2110 (4,900) yet in hands-on usage performed much better. This score is less than the Galaxy S3 smartphone (5,000) and the Galaxy Note 10.1 tablet (5,100), though for something in this price range it’s very good. It out-performs the Nexus 7 (3,500), as well. As we’ve seen with most tablets, the cameras on the IdeaTab aren’t particularly notable. Since the rear camera lacks a flash it’s only truly usable indoors if the room is well lit. Shots taken on sunny days are decent enough for sharing on social networks. The front camera lacks sharpness but is good enough for video chats and performed well in Google Hangout tests. Lenovo claims 10 hours of battery life for the IdeaTab A2109 and in our testing this turned out to be pretty accurate. The tablet lasted all day with heavy usage. After over 5 hours of continuous use — watching video, playing games, and browsing — the battery meter read 49 percent. Once again, Lenovo came really close to making a great tablet, but one major flaw keeps the IdeaPad A2109 from a wholehearted recommendation. The display’s narrow viewing angles will affect media lovers and gamers more than people who mainly use their tablets to read or surf the web. But tablets at this size are made for the kind of people who like to do all of those things equally. Yes, the budget $300 price means that every aspect won’t be top of the line. But given what many buyers will want to use this tablet for, this drawback can put buyers off. It’s too bad, because the IdeaTab A2109 has a great design, speedy performance, and a “just right” form factor.